It is generally acknowledged that back pain (BP) is a common condition already in childhood. However, the development until early adulthood is not well understood and, in particular, not the individual tracking pattern. The objectives of this paper are to show the prevalence estimates of BP, low back pain (LBP), mid back pain (MBP), neck pain (NP), and care-seeking because of BP at three different ages (9, 13 and15 years) and how the BP reporting tracks over these age groups over three consecutive surveys. A longitudinal cohort study was carried out from the years of 1997 till 2005, collecting interview data from children who were sampled to be representative of Danish schoolchildren. BP was defined overall and specifically in the three spinal regions as having reported pain within the past month. The prevalence estimates and the various patterns of BP reporting over time are presented as percentages. Of the 771 children sampled, 62%, 57%, and 58% participated in the three back surveys and 34% participated in all three. The prevalence estimates for children at the ages of 9, 13, and 15, respectively, were for BP 33%, 28%, and 48%; for LBP 4%, 22%, and 36%; for MBP 20%, 13%, and 35%; and for NP 10%, 7%, and 15%. Seeking care for BP increased from 6% and 8% at the two youngest ages to 34% at the oldest. Only 7% of the children who participated in all three surveys reported BP each time and 30% of these always reported no pain. The patterns of development differed for the three spinal regions and between genders. Status at the previous survey predicted status at the next survey, so that those who had pain before were more likely to report pain again and vice versa. This was most pronounced for care-seeking. It is well known that back pain (BP) is a common and costly problem in the general population. Previously, BP in children was considered rare and a sign of a potentially serious disorder [1, 2]. Today, according to a recent systematic review, the general opinion would be that BP, including low back pain (LBP), mid back pain (MBP) and neck pain (NP), starts already early in life to accelerate during the early teens up till early adulthood  and that its presence in young age is a precursor for BP also in adulthood . In order to approach the issues of prevention and treatment it is helpful to understand the extent and course of a disease, particularly around the time of its onset and that picture is, presently, far from clear. Methodological and definition issues can partly explain this . However, this is also a question of the study objectives and design. It is therefore not surprising that the estimates from various studies vary and that often they make no sense. Also, there appears to be no credible data on the true incidence for each spinal region in young people. In addition, it is not clear to what extent BP in youngsters results in consequences such as those seen in adults, namely reduced activities, sick leave (i.e. absence from school), and consultations with health care practitioners. We found only few studies on children and adolescents dealing with this topic but their conclusions differed. 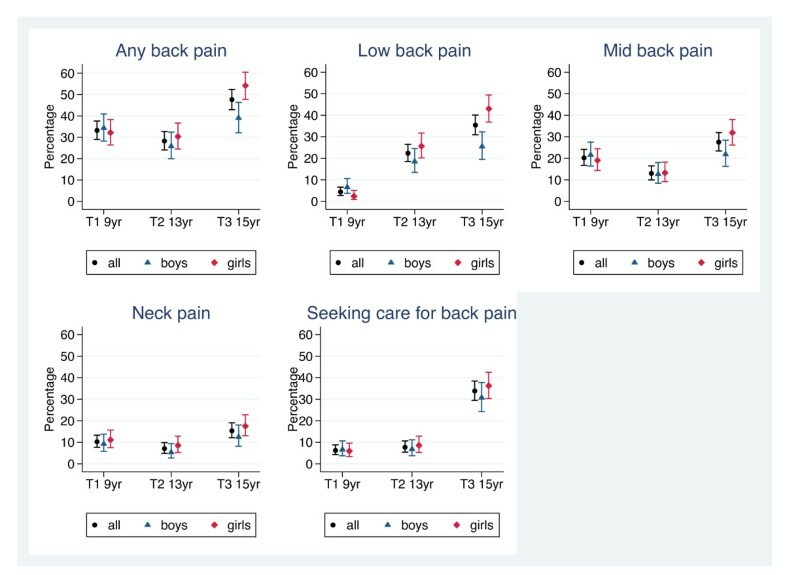 Auvinen et al  reported that the seeking of health care increased with age for both LBP and NP, whereas others found no such increase [6, 7]. In another study, no associations with age were found for reduced activities and taking time off from school . Others who reported on this issue did not take age into account. It is therefore not known if these consequences are proportional to the prevalence of pain at the various ages or if the consequences have an age-related profile of their own. To describe the prevalence of BP (including LBP, MB and NP) and care seeking in these children when they were aged 9, 13 and 15 years. To study to which extent BP and care seeking track over time in these children at these three points in time. Four years later, in 2001/2, those participating in the study at T1 and still living in the same area were invited to a second investigation regarding BP. At this second time point the children had an MRI of the lumbar spine, were questioned about BP, and measurements of body composition were taken . All children were picked up at their schools by taxi and brought to the Spine Centre of Southern Denmark, Ringe. Flowchart. 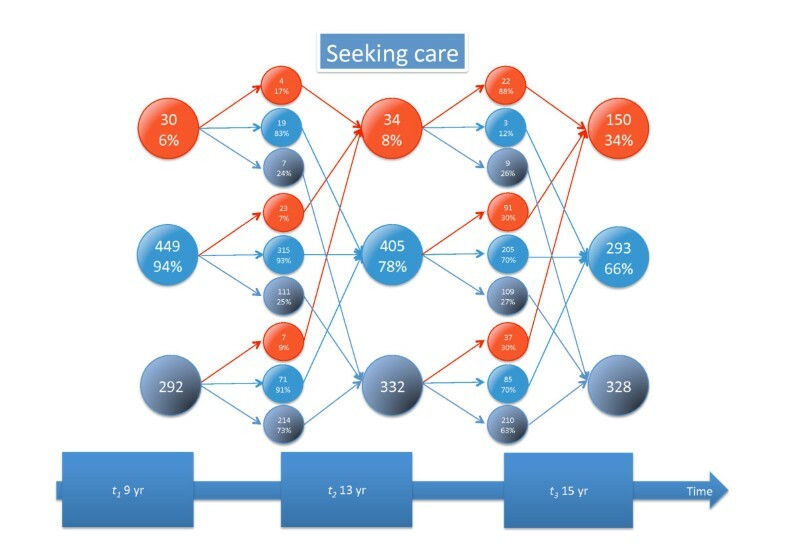 Flow of participants in a longitudinal study of Danish children/adolescents at three time points (T1, T2 and T3). The 38 relevant state schools in the municipality of Odense (180,000 inhabitants) were stratified according to their location (urban, suburban, rural) and the socio-economic character of their uptake area . From each stratum, a proportional, two-stage cluster sample of children was selected. The primary units (clusters) were the schools. The sampling frame was all the schools in the town, from which schools were selected using probability, proportional to school size. Each school on the list was allocated a weighting equivalent to the number of children enrolled, who were eligible to be selected for the study. The secondary units were the children in the schools. Equal numbers of children in the third and ninth grades (a maximum of 30 individuals from each grade and school) were sampled from each school. Children in the appropriate age bands (8 to 10 years and 14 to 16 years) were allocated code numbers and then randomly selected using random number tables. For this report, only the young cohort is used. Experience from previous studies of children using a similar method suggested that a likely response rate from schools would be 90%, and that a 75% to 80% response rate from the children or their parents could be expected [13, 14]. Estimates of power were based on the cardiovascular aspect of the study, which is described elsewhere, and a maximum non-response rate of 25% was predicted . This required a minimum of 4 × 250 participants (i.e. 250 children in each age and gender subgroup). It has been shown that the income of the parents of the children participating at T1 was similar to the rest of the Danish general population, whereas the parents' educational level was slightly higher . We have not further addressed the characteristics of non-responders. 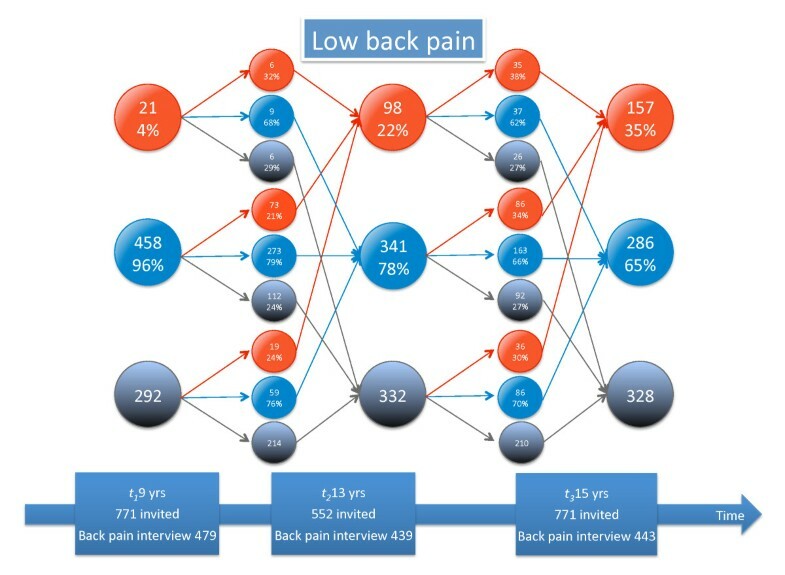 Data on LBP were collected using an interview developed on the basis of previously used nation-wide surveys and tested for feasibility in relation to the first data collection [8, 16]. The children were asked if they had any spinal pain (LBP, MBP or NP) at the moment, within the past week, or within the past month in order to establish the one-month period prevalence. Those who responded positively to any of these questions were asked to show the location of the pain. The lumbo-pelvic, thoracic, and cervical spine and the corresponding posterior aspects of the body surface were defined as low back, middle back, and neck, respectively. If the child had problems showing the area, the interviewer put one hand subsequently on the neck, thoracic and lumbar area while asking: "Was it in this area?" If the child reported back pain, the following questions were asked: "Did you because of back pain a) stop participation in physical activity such as sports or play? b) stay home from school up to 3 days, c) stay home from school for more than 3 days? d) see a physician once? e) see a physician more than once? f) see a physical therapist or participate in special gymnastics? g) go to a hospital?" The question f) "see a physical therapist" was included in the second and third surveys only . At T2 the children also filled in a questionnaire on back pain that had previously been used on Danish schoolchildren . Therefore, the possibility of comparing answers from interviews with answers from questionnaire existed. Analyses of the different responses lead to the conclusion that data from the interview were the most credible . Summary of demographic and study data in a longitudinal study of Danish children/adolescents at three time points (T1, T2 and T3). Prevalence rates of different types of back pain and care seeking in a cohort of Danish children/adolescents surveyed at three time points (T1, T2 and T3). N refers to the total number of children and n the number of children with a certain type of back pain. Prevalence of back pain and seeking care. 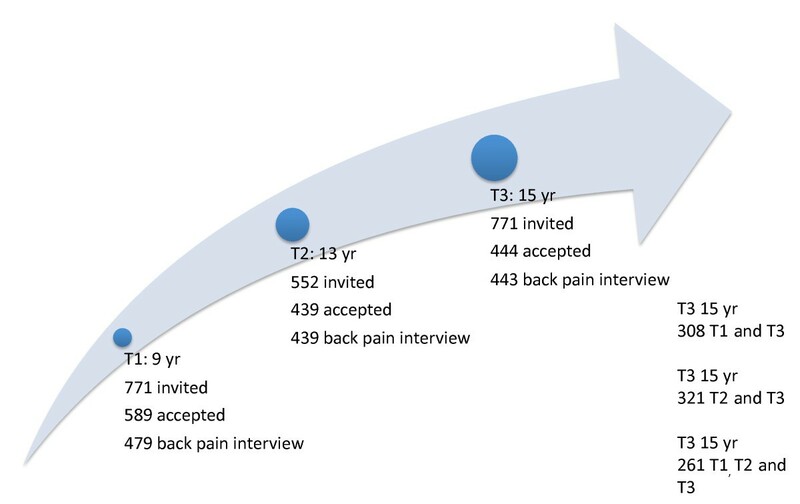 The one month prevalence rates given in percentages for back, neck, mid back, and low back pain as well as related care seeking in a cohort of Danish children/adolescents at three time points (T1 (N = 479), T2 (N = 439), and T3 (N = 443). The bars indicate the 95% confidence intervals for the estimates. Probability (given in percentage) of reporting back pain depending on the back pain status at the previous data collection point in a cohort of Danish children/adolescents surveyed at three time points (T1, T2 and T3). Detailed information about tracking of different types of back pain and seeking care is given in Figures 3, 4, 5, 6, 7, and 8. Explanation of Figures 4-8. Patterns of reporting types of back pain or seeking care for back pain. P = pain. Red is pain reporting, blue, no pain reporting, and grey is those not in study. The arrows to the smaller circles show the patterns of reporting at the next time-point: still P (reporting pain again), no P (now not reporting pain), left (leaving the study), Got P (changing from not reporting to reporting pain), Still no P (reporting no pain again). P new (entering the study and reporting pain, No P new (entering the study but not reporting pain), question marks (not in study at that specific time of data collection). The three small circles do not sum to 100%: The percentages with pain and without pain for those still in study are given whereas the percentage of those leaving or staying out of the study are given in relation to the number of people in that category in previous study. Back pain tracking. For explanation, see Figure 3. Low back pain tracking. For explanation, see Figure 3. Mid back pain tracking. For explanation, see Figure 3. 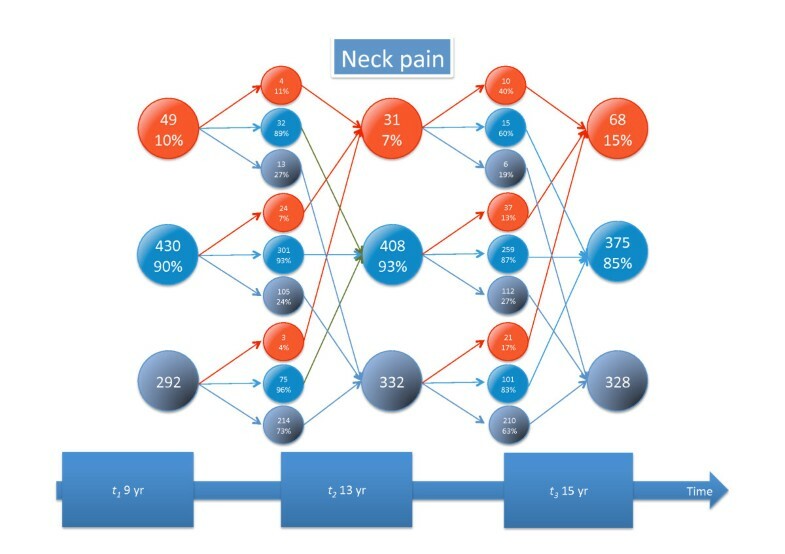 Neck pain tracking. For explanation, see Figure 3. Tracking of seeking care for back pain. For explanation, see Figure 3. Comparisons with other studies are not easily done, as we could not find any that included the same age groups and studied all spinal areas. There is, of course, no obvious reason to doubt that BP starts early and since it is more common in young adults than in children, it has to increase in adolescence. This has been shown, for example, by Stanford et al in a recent population-based study on "weekly or more recurrent BP" . That BP at this age is fairly uncommon was convincingly shown also in a study by Dunn et al . About 3/4 of their 11-14 yr olds belonged to the "no pain problem" groups, when BP was defined as "pain in the past three months that lasted a whole day or more, or that had occurred several times in a year" and when the trajectory pattern was measured as often as three times per year over three years. The stability of this pattern (tracking) was apparent also from their results.